Note: This process only work if you subscribe to both dsSearchAgent and dsIDXpress. In a previous post, we showed you how to use dsIDXpress’ custom link-structure to create a community landing page. It involved building out various link-structures using several different parameters for dsIDXpress. Then, you’re going to click on “Create New Link” on the right-hand side. That will take you to the page where you can begin to add all of the criteria for your new custom link: the map, fields, property types, features, etc. Here’s the important part… What you “title” your new custom link is going to display as the title tag for your dsIDXpress virtual page. So if you want to use something keyword rich and specific, this is the play to do it. In my example, my title reads: Los Angeles Condos for Sale Between $300,000 – $400,000. Step 2: Find your Link ID # and use it to build your dsIDXpress link-structure. …which of course renders the following page with the generic title: City of Los Angeles – Irvine Real Estate (and it’s corresponding results). Want to display results using shortcode on a post/page? …no problem. Click on the shortcode button to insert multiple property listings. This time, instead of using the Quick Search tab to insert your criteria, click on the “Pre-Saved Links” tab and select your newly created custom link from the drop-down. 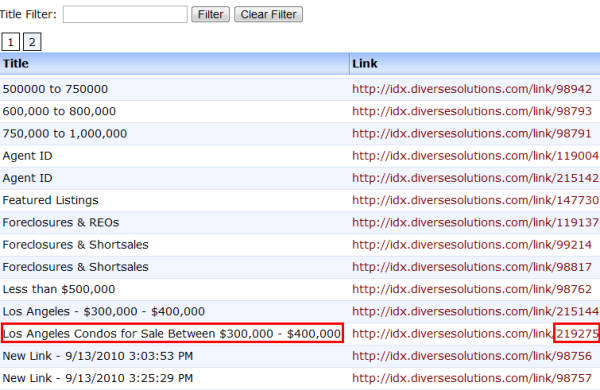 Select the number of listings you want to display and click “Insert Listings” and presto! Now remember, this will only work if you’re using both dsSearchAgent and dsIDXpress. It’s a quicker way to create a custom link structure for your virtual pages and one way to add custom titles to your dsIDXpress virtual pages as well.